Diana Redwood is a senior program manager at Alaska Native Tribal Health Consortium who specializes in colon cancer prevention and a good sense of humor. 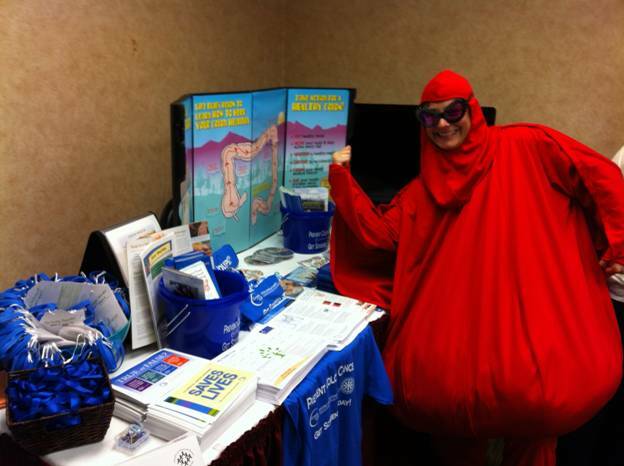 She has been known to suit up as a giant red polyp named Polyp Man, wear an apron printed with abdominal organs and travel with an enormous inflatable colon named Nolan to promote colorectal health and prevention. Redwood grew up in Palmer, but attended Evergreen State College in Washington to receive a degree in Nutrition and Food Studies before pursuing a double masters in Community Nutrition plus Food Policy and Applied Economics at Tufts University in Boston. 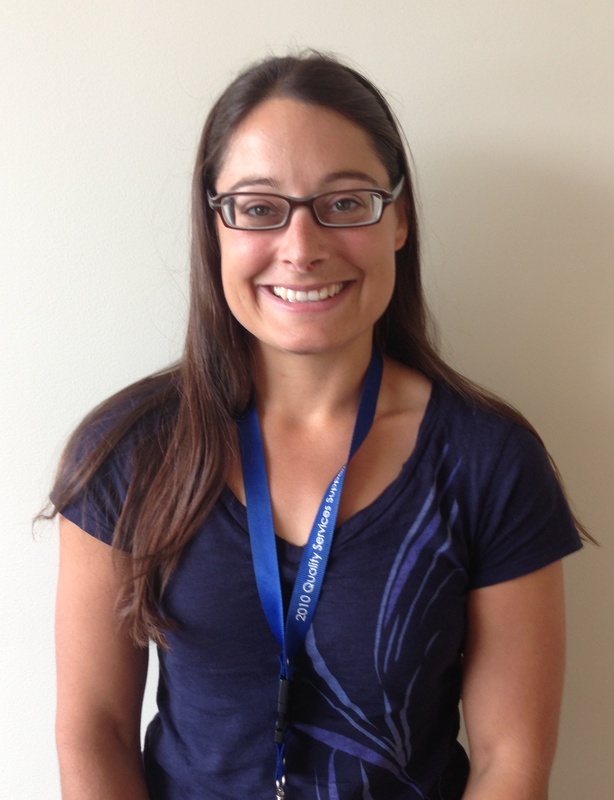 She moved back to Alaska in 2004 and took a job at ANTHC working on the EARTH (Education and Research Towards Health) study to analyze the dietary and physical activity patterns of research participants in Native communities around the state. ANTHC maintains a “tumor registry” of cancer prevalence in the Native population and the data revealed a population with double the average rate of colorectal cancer. Colon cancer is easy to detect and treat with regular colonoscopies and has a 90% survival rate if it is identified in Stage I or Stage II. Redwood got involved in 2007 and became the senior program manager for the Colorectal Cancer Control Program in 2009. Aided by a grant from the Centers for Disease Control, the program provides community education and promotes prevention through regular screening. The CRC program is part of the Alaska Native Epidemiology Center, but does not receive funding from ANTHC. Redwood manages a complex portfolio of grants from the CDC, Mayo Clinic, National Institutes of Health, and the National Cancer Institute to provide outreach and education. Each grant has a different focus and provides a variety of methods to educate the public, identify lifestyle risks like diet and smoking and engineer creative ways to encourage regular screening. Her office is filled with informational brochures, educational DVD’s, appointment reminder postcards, t-shirts, berry buckets and coffee sleeves printed with messages like, “Get behind your screening, no butts about it.” Redwood has even authored some of their humorous marketing messages. Another educational tool is Nolan the Colon, a towering 25 foot inflatable colon that blows up to more than 14 feet tall. The exhibit was designed by ANTHC and other clinical providers to offer visitors an interactive opportunity to walk through a healthy colon and see how polyps develop into cancer. Nolan has made appearances all over Alaska and is often accompanied by a community educator who can answer questions and schedule a colonoscopy. The exhibit was so popular that ANTHC recently purchased a smaller version named Nolan Junior that is six feet long and weighs only 48 pounds for communities with smaller meeting spaces or weight-sensitive flight service. Education is an important component, but access to care is also critical. Alaska’s expansive geography presents difficult challenges and patients often have to fly to the Alaska Native Medical Center in Anchorage or a community hub like Bethel to receive their colonoscopy. Redwood has worked closely with regional health providers to implement training and send teams with equipment directly to communities for mini-clinics. ANTHC’s Epidemiology Center also employs three patient navigators who identify individuals that are coming in for other procedures and help “bundle” services so they can schedule a colonoscopy or mammogram during the same visit. Despite great geographic, financial and systemic challenges, Diana Redwood’s dedication to public health is unwavering. At the end of every day she commutes home on her bike feeling proud that her work is slowly beating the ugly adversary of cancer into remission.